I was invited by Goblin Quest creator Grant Howitt to design the cover branding and contribute several interior illustrations for his freeform RPG. Among my tasks was creating the definitive look for player and non-player characters in the book: The eponymous goblins, as well as Wizards, Bugbears, Hobgoblins and Orcs. Additionally, I illustrated the map which defined the boundaries of the world of Goblin Quest. Goblin Quest is available for sale and download here. Broad, inventive and comical action. The make-piece nature of the gameplay and accessories. I laid out the basic structure of the logo in pencil on bristol, and later reproduced it in pen-and-ink via lightbox. The resulting illustration was fed through Illustrator to clean the lines and provide a stark version of the linework. Textures and colors were laid in the add levels of wet, slimy grossness to the "Goblin" portion of the text, and knocked out parts of the "Q" and "T" in "Quest," to unite the elements. Highlights were added in order to give "Goblin" a gelatinous -- or "snot-like" --appearance. The individual words were composed to create a compelling and easily-identifiable silhouette. The heavy stroke made the logo appropriate for reproduction as stickers, pins, t-shirts, embroidered badges and other merchandise, if required. The cover design went through multiple stages of communication and sketching. The essential message of the piece focused on "Goblins competing for garbage," the essence of the game. The result was this collection of four possible layouts. The third, featuring a triumphant goblin atop a mountain of garbage, most expressed the gross, weird and epic feel of the game. The thumbnail for the cover was enlarged and transferred to Bristol board via lightbox. Rough shapes and figures were fleshed out in pencil, and directly inked on the same page. The mountain of garbage on which our triumphant hero poses was generally fleshed out on the fly, adding and removing pieces as it seemed to fit the overall balance of the piece. Distant figures were roughly drawn in, so as to keep the focus on the central figure and his pan of bacon and eggs -- the apparent prize in this particular quest. Colors were added digitally in Photoshop. The process requires multiple layers for different techniques, beginning with separating several elements of the linework into individual layers. The heroic figure and his mound of garbage takes precedence, with the goblins at the bottom of the hill occupying their own layer, the mountain in the background occupying another, and the distant goblins thereupon occupying another. 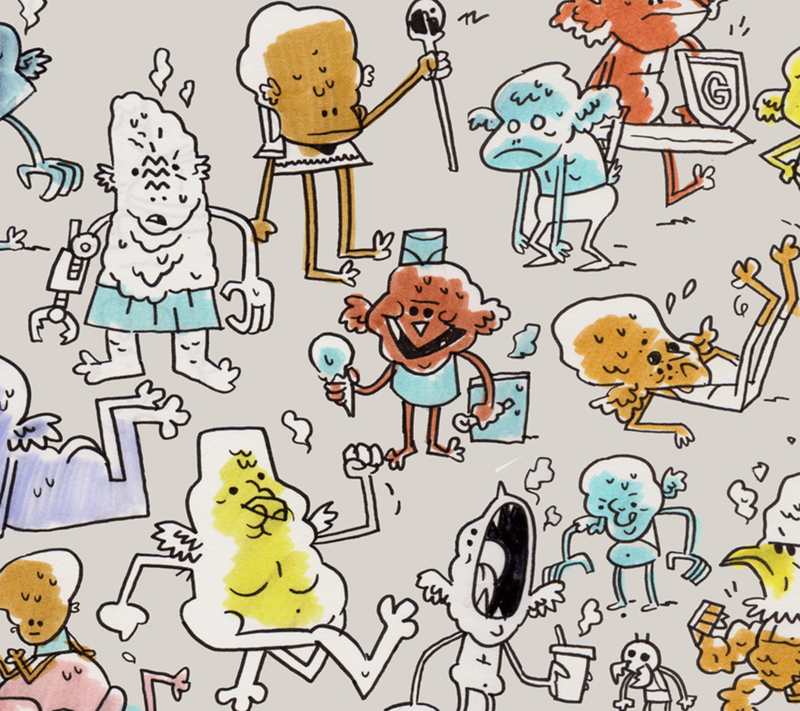 Flats were laid down under each linework layer, and a gradient background created the essentials of the palette. The blue sky ringed with clouds was kept light and airy in order to help the title pop more clearly, and to contrast with the dirty rust-color of the garbage mound and surrounding ground. Lastly, several distinct texture layers are inserted into the color layers, lending it some depth and grit. With that, all it needs is the logo and -- voila! Goblin Quest, the cover! An assortment of rough sketches which preceded the art for the game. 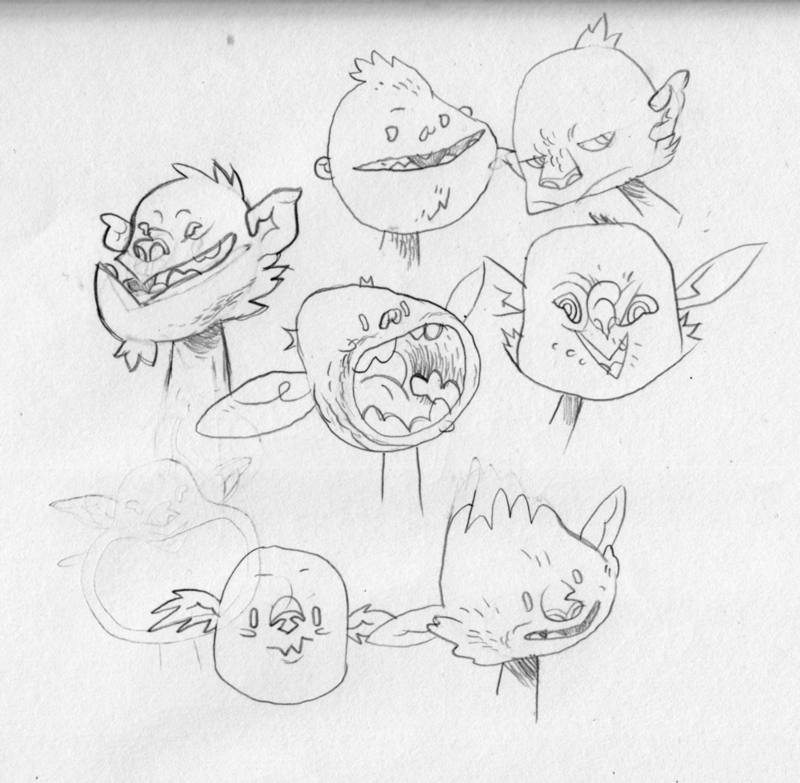 A range of goblin expressions. Bugbear studies, at rest and play. Finished illustrations which were featured in the game or in the related products. Wizards, attempting to pass for human. An orc in his Sunday finery. A goblin warrior rushes to the fray. A proud bearer of the torch of goblin liberty. A goblin glimjack, armed with a vicious pepper mill. An assortment of goblin weapons and paraphernalia.